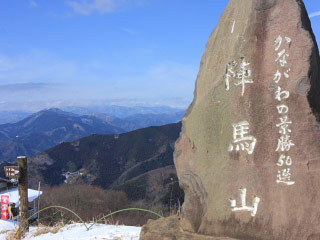 Mt.Jimba (陣馬山) is one of popular mountain located in Kanagawa. It is about 855m tall and has a great view of Mt. Fuji. It is chosen as 50 best views of Kanagawa. Because of its easy access from Tokyo, many people enjoy hiking. There are many parking space for this trekking. Trekking takes about 3 houses in total. 1. use JR Chuo Line to Fujino. 2. use local bus to Jimbasantozanguchi. Mt. Jimba is one of popular one day hiking spot in Kanagawa. From the top of Jimbasan, it has a great view of Mt. Fuji. The trekking route is connected to Mt. Takao. So, some people travel from Mt. Takao to this mountain. At the top of the mountain, there are tea houses and restroom. However, there is no water point. It is very easy mountain so that kids can enjoy.